Note: I write from the perspective of a non-Indigenous person, as a non-white immigrant settler. My aim is to share what I have learned by taking courses in Indigenous studies, through talks, films, and other means, and through personal observation. I would like to thank Nicole from the planning committee of the “Resurgence, Reconciliation, and Revitalization” conference, Paige Isaac from the First Peoples’ House, and professor Allan Downey for their insight and input. In the last few years, you may have heard a land acknowledgment given at the beginning of events on the McGill campus. The speaker would acknowledge that Montreal is located on Kanien’kehá:ka land, a historical gathering place for different First Nations. The statement stops there, and, feeling that the work is done, the group can move on to the ‘real’ discussion at hand. The land acknowledgement becomes routine, empty, and tokenizing, rather than a meaningful effort to recognize the historical and ongoing colonization of the people of this land. The decolonization of our university requires such a genuine effort, both at the personal and institutional levels. My family comes from South Asia, a region massively impacted and divided by British rule. Many of the same histories, methods, and distortions of colonialism are present in Canada, this new place where we have settled. As I attempt to grapple with why I am in Canada and why this country is the way it is, I have come to realize that my understanding is based on a mixture of facts, misrepresentations, and outright lies. The task of decolonizing my education has forced me to take a more critical look at the history of this country. The peace and prosperity that Canada has offered to some has come at the cost of tremendous violence toward its Indigenous inhabitants. The myth that Canada was an empty land, benignly occupied and then built in a peaceful fashion is just that: a myth, as is the perception of Canada as an inherently diverse and multicultural land, where our open values ensure that opportunity abounds for all. The myth that Canada was an empty land, benignly occupied and then built in a peaceful fashion is just that: a myth. The terror and shame of residential schools, the last of which closed in 1996; the disastrous Indian Act, which established the reserve system and remains in effect today; the Potlatch Ban; countless treaty violations – these are not isolated acts, but are part of a settler-colonial nation-building process and ideology that remains alive today. The current state of Indigenous housing is abhorrent, as is the terrible underfunding of schools on reserves. Thousands of missing and murdered Indigenous women have been virtually ignored by governments past and present. Clean drinking water and reasonably priced food are hard to come by on many reservations, and Chief Edward John of the Tl’azt’en Nation in British Columbia has warned that Indigenous languages around the world are going extinct. Suffice it to say that the exploitation of Indigenous people is embedded in our very culture and institutions. The recently implemented Indigenous Studies minor, launched about a year ago as part of the McGill Institute for the Study of Canada, offers a way for students to confront the violent colonial processes on which this country is founded, and, hopefully, guide settlers in what we can do as allies to Indigenous resistances. The minor program was the fruit of the labour put in by many students, faculty, and staff, and currently includes an introductory course and a seminar in Indigenous Studies, as well as interdepartmental courses on Indigenous art and on histories of the colonization of the Americas. Many will argue that this is enough, but this would be an inaccurate, cowardly assessment. How can an educational institution sit on this land if so much of its community knows so little about what has happened and is happening here? How can we produce meaningful knowledge about this school, this city, this country when so many of us don’t understand its history? The TRC’s recommendations include integrating Indigenous teaching and knowledge methods to counteract dominant Eurocentric frameworks and ways of knowing and teaching Indigenous law and anti-racism in universities. Since the publication of the TRC’s report, the Peter A. Allard School of Law at the University of British Columbia has expanded its course offering in Indigenous law, and the University of Saskatchewan has hosted a forum on how universities can best implement the TRC recommendations. As students who care about justice, equality, and knowledge, we have to ask: what is this education worth if it perpetuates colonial myths and pays no attention to Indigenous perspectives? These universities also have substantial numbers of Indigenous tenured and tenure-track professors, while McGill has only a single Indigenous tenure-track professor. 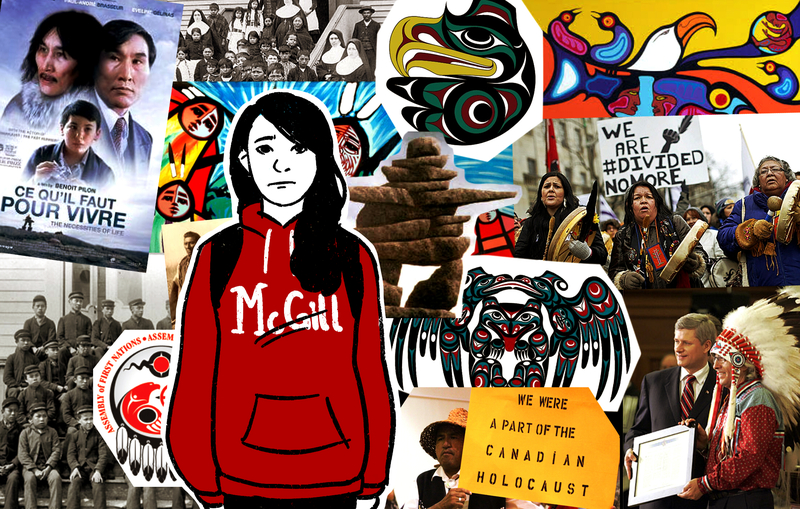 Although the minor program is a step in the right direction, McGill needs to work more on retaining Indigenous staff, faculty, and students, as well as bringing Indigenous perspectives to the forefront of our values and actions. McGill also needs to provide greater support to initiatives such as the upcoming academic conference “Resurgence, Reconciliation, and Revitalization: Diverse Indigenous Perspectives” to be held in March. This work cannot and should not all be done by Indigenous students, faculty, and staff. As students who care about justice, equality, and knowledge, we have to ask: what is this education worth if it perpetuates colonial myths and pays no attention to Indigenous perspectives? As students, we must re-frame our own classes in a way that takes into account Indigenous perspectives, and connect the struggles of Indigenous peoples in this country to those going on globally. By looking at alternative histories and new ways of telling them, and having conversations that prioritize marginalized voices, settlers among us can reposition Indigenous issues from the periphery of our consciousness to the centre. Those of us who are settlers, and those of us who have been subject to colonial rule elsewhere, have to unlearn what we ‘know’ about the past. Decolonization must happen in our educational spaces and institutions, as well as in our minds and our hearts. Ayesha Talreja is a U3 Arts student. To contact her, email commentary@mcgilldaily.com.